This Seasonal soap is a beautiful combination of sweet oranges with a touch of cinnamon and cloves. We made this with all steam distilled essential oils and colored it bright orange. 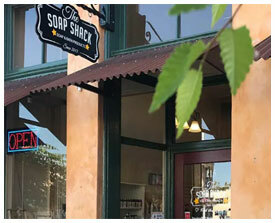 We handcraft our soap bars in small batches right in downtown Lakeport, California in our brick and mortar store. They are all all olive oil based and than we add our formulation of natural and organic skin loving oils and butters to create the perfect bar of soap that is balanced enough for all skin types leaving your skin refreshed and moisturized. We also add a variety or herbs and clay and other natural additives depending on the bar you choose that benefit the skin in different ways. You will notice that our bars smell amazing and the scent lasts until your bar is used up and that is because we only select the highest quality essential oils and fragrance oils for our products. Yes our soap bar labels are made of seeded paper so you can actually plant them and grow random wild flowers and herbs. Its easy to do just place soil in a pot, right to the top. Gently pack the soil, so it's slightly compressed, but not too hard-packed. Place the seed paper on top, and add another thin layer of soil on top of the paper (about one-eighth of an inch). Give your newly planted seed paper a good soak of water right off the bat. After that, just make sure it's always moist. This may mean watering it a little bit every day or two, but just enough to maintain that level of moisture. Just make sure your planted seed paper is in a sunny area, and you should hopefully start seeing some little green sprouts pop up within a few weeks! Distilled water, olive oil, coconut oil, shea butter, cocoa butter, steam distilled orange, cinnamon and clove essential oils, pigment.